Vestment available in all Liturgical colors. Embroidered front only. Add a Memorial Label to commemorate a loved one or a Special Occasion. Memorial Label charge: 2 lines for $20.00, additional 3rd line $10.00. This full Gothic style chasuble is attractively embroidered with the traditional Celtic cross in kelly green amply cut in textured Fortrel-Polyester linen weave. Your choice of symbol on front or front and back. 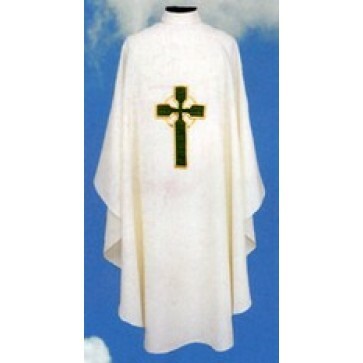 Dress the vestment up with a 3 ½" roll collar. Self-lined stole included. Matching Chalice veil available with or without Celtic cross. Personalized embroidered Memorial Label available for Ordinations, Anniversaries, Jubilees, or remembering a loved one.